11am GOOD FRIDAY Ecumenical Service at Epworth United Church. The youth of our parish have decided to defer their trip to the CLAY Conference. The fundraising done by our youth for CLAY 2018 will instead be directed to the next meeting of CLAY, in the summer of 2020, location TBD. 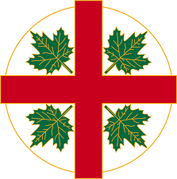 The Anglican Parish of New Germany is a large geographical parish with four historic churches, St. Andrew's, St. John-in-the-Wilderness, St. Paul's and Transfiguration, each with its own welcoming distinct community. It is a supportive community steeped in faith and committed to the gospel of Christ. This is reflected in the activities we choose to do, such as our bible studies, youth activities, and outreach to local organizations. The Anglican Parish of New Germany supports the Primates World Relief Development Fund (PWRDF) and Mission to Seafarers. Our web site is a mission project we are delighted to share and hope to expand its capacity to reach others to its fullest potential. Within the Anglican Parish of New Germany we regularly get together for combined parish services and enjoy fellowship in our fundraising activities and social events. All of these activities are integral to our life and mission. "We are a parish family committed to growth and service in faith, unity, love, outreach and mission”.